Reiki is a Japanese technique for stress reduction, relaxation, and healing. It was developed by Japanese Buddhist Mikao Usui in 1922 and has been adapted into different techniques around the world. It is administered by “laying on hands” and is based on the idea that an unseen life force energy (God) flows through us and is what causes us to be alive [source: Reiki.org]. According to Reiki Healer and Life Coach Kimi Lu, Reiki’s popularity in the Philippines spiked in in 2012 when the growing number of yoginis used it to complement their practice. In Hollywood, celebrities such as Sandra Bullock and Shania Twain are fans of Reiki. In Manila, Lu has given Reiki sessions to top bloggers such as Jackie Go and celebs such as Fabio Ide. Lu has been practicing Reiki since 2010 and lists its top five benefits based on her personal practice and feedback from clients. 1. It’s a form of alternative healing. 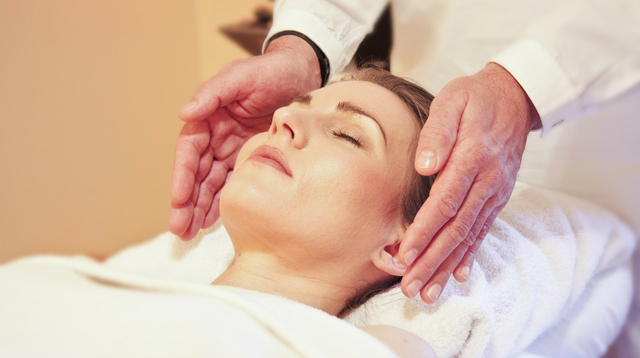 Many people who have tried Reiki describe the after feeling as “a wonderful glowing radiance that flows through and around you [via Reiki.org].” Each session targets the person’s body, emotions, mind, and spirit. 2. It will help reduce your stress. “When explaining Reiki to a beginner, I always use the analogy of a laptop or a hard drive to represent the chakras or energy folders in our body,” explained Lu. “If one folder or chakra has too much unnecessary files and junk, then it slows down the whole laptop and sometimes it even hangs, so you need to reboot. Reiki is rebooting your energy.” Each session aims to give you a more peaceful mind and calmer self. 3. It complements your yoga practice. Because it’s a kind of meditation, Reiki seeks to bring people to a state of wholeness in body, emotions, mind, and spirit, which is much like the practice of yoga [source: Reiki for Holistic Health]. The practice of yoga increases the flow of Reiki energy in a person’s life, while Reiki helps a person understand the deeper energies of yoga. 4. It helps you radiate and spread happiness. According to Reiki Rays blogger Justin Melton, “Your mind, body, and spirit go through a purification process that in the end leaves you in a true state of happiness.” Some experience it on the first few sessions, while other take a few months to years before they learn to manage life’s stressors and depressors using Reiki techniques. 5. It will strengthen your faith in a higher being. One of the biggest misconceptions about Reiki is that it’s a religion or cult. While Reiki is spiritual in nature, it has no dogma and it isn't dependent on one sole religion. Reiki founder Mikao Usui recommended the practice of simple ethical ideals to promote peace, harmony, a life of balance, and spiritual growth, which are nearly universal across all cultures and religions [Reiki.org]. Reiki’s non-physical healing energy is made up of life force energy that is guided by what they describe as higher intelligence, a spiritually guided life force energy, or simply, the universal God.